So I’ve recently finished reading this book, and while I’ve attempted to read other books (I have this irrepressible need to keep reading, you know what I mean? ), nothing quite sticks. The problem at hand is that I cannot get my head out of this book, this brilliant book, even after putting it down and walking away. I am bursting at the seams with all these thoughts about it. If I don’t get these thoughts down somewhere, it feels like they might disappear, along with my memory of reading it, all those awe-struck, breath-holding, mind-blown emotions that are coursing through my blood vessels, making it unable to read anything new. Do you ever feel that way about a book that has just struck you, knocked you down flat and held your mind ransom for the days that you read it? Because that’s what Bitter in the Mouth has done to me. It has undone me. I’ve spent the past few days reluctantly inching to the end of the book. I didn’t want to run out of story. But as I was checking out the available e-books on my library’s Overdrive catalogue, I stopped and considered it. And then, as I usually do, I checked it out on Goodreads, which was where I saw a 4-star rating from a friend (thanks Yu-Mei! ), and thought, ok let’s check it out. And well, I sure wasn’t expecting this, any of this! First of all, there is synesthesia, a neurological condition. Our narrator Linda experiences words as tastes. Her name ‘Linda’ tastes like mint, for instance. (That already fascinates me, to hear words and to taste them in her mouth). But this quirk, while fascinating – and putting the ‘bitter’ literally in the mouth – is not what made the story for me. “Youcannedgreenbeans neverbubblegum say anyricethingtomato to me now,” Kelly said, rolling her eyes. 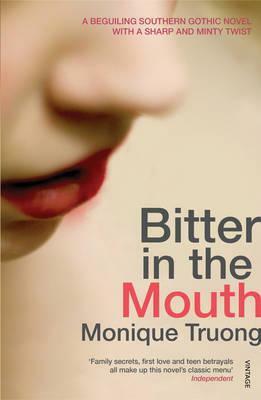 Truong made me fall for her characters, from her very first line right to the (argh why did this have to end?) end. Here we have Linda, and her funny great-uncle Harper, who was her first love. His books were shelved in alphabetical order but not by titles. A for “Acerbic,” B for “Buy Another Copy as Gift,” C for “Cow Dung, as in This Stinks,” D for “Devastating,” E for “Explore Further,” F for “Foreign” (foreign meant that my great-uncle couldn’t relate to the characters in the book, not that the author was from another country), and so on . He would explain the system to me and give me typewritten pages identifying all twenty-six categories. Linda’s mother DeAnne is one we are not meant to like. She’s like the cruel stepmother of fairy tales beloved. They have a difficult relationship – she calls her ‘DeAnne’ and not ‘Mom’, and Linda is careful to point out all the highlights of their years together, noting that she loved DeAnne only from the ages of 7 to 11, because that’s what she thought she was meant to do. And because we are told all of this from Linda’s perspective, we lack all that other knowledge, the memories that are left untold, the stories from other points of view that we do not see. But Truong gradually reveals some of these secrets, some which we – and Linda – realise were hidden in plain sight all along. There is no big reveal, no ‘ta-da!’ with the showgirl whisking away the curtain. There is only the subtle, the shoes under the curtains, telling us what everyone else already knew (or thought they knew). It made this big-city-state-born-and-bred Singaporean (who had only ever eaten/made a Bundt cake or meatloaf in the past few years) live and breathe that small town life. And be eternally grateful that my Dad, who worked for an American company, never uprooted us from Singapore to a small town in upstate New York. 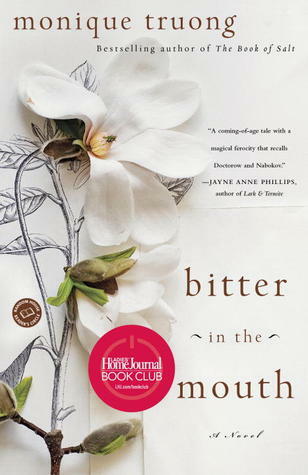 Bitter in the Mouth is such a gorgeous book, and I’m just going to go all out and say it – one of my favourite reads of the year. 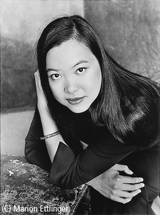 Monique Truong is a Vietnamese American writer living in Brooklyn, New York. Truong left Vietnam for the United States in 1975. She served in the past as an associate fiction editor for the Asian Pacific American Journal, a literary publication of the Asian American Workshop based in New York City. 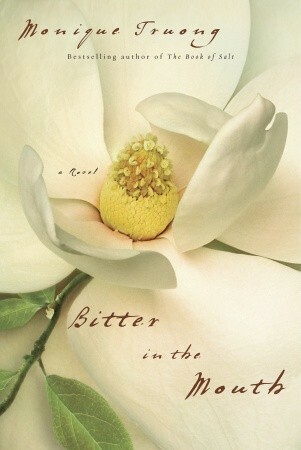 Just reserved it from the library and hope I get the book with the cover that is just calling out “read me”! Being in the UK we do often have quite boring covers! I hope you enjoy it! I really loved it!